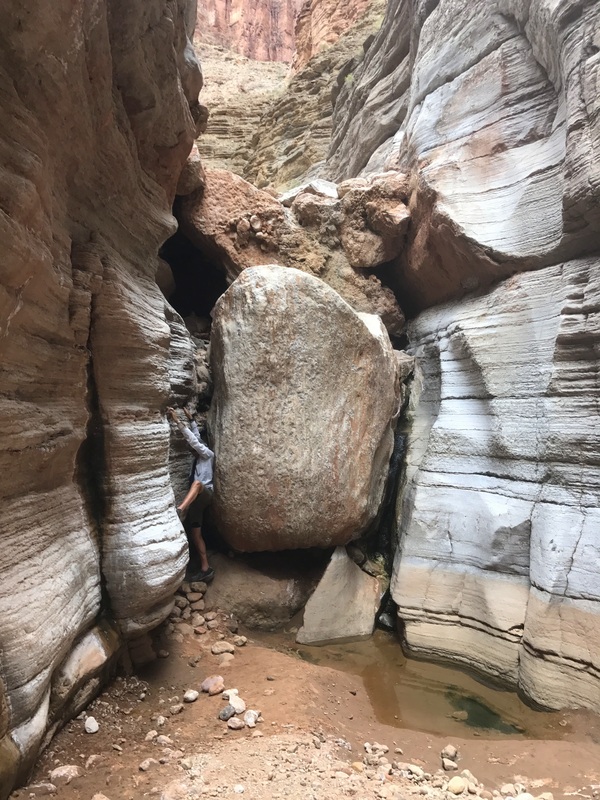 We left off in the last post having boated 78 miles, about five days on a typical trip, and having encountered the last of the suite of three books that comprise the geological story revealed in the Grand Canyon. We also concluded that the fluctuations in the altitudes of land and sea evident in the story appears to be the breathing of a great beast deep within our planet. In the 78 miles we have navigated 16 rapids with holes big enough to turn our 18′ rafts upside down. These holes result from the water’s defiance of gravity and momentum to curl back upstream to fill voids in the flow when the water is forced to pass around rocks. It curls back upstream to reduce the gradient in potential energy from the disturbance of the water’s cohesive force, and increase the entropy. Fortunately, age and experience can influence luck, and this was our first trip where nobody was even out of the boats in a rapid. The Vishnu metamorphic complex brings us to a really staggering unconformity, called the Great Unconformity. 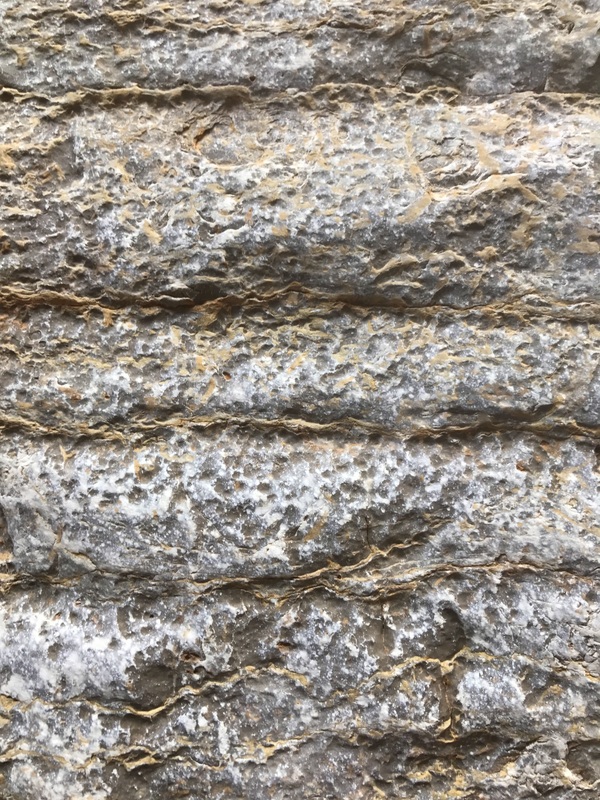 We may recall that the Tapeats sandstone began to be deposited about 545 mya, just slightly before the Cambrian period, the first period of the Paleozoic era 540 mya. 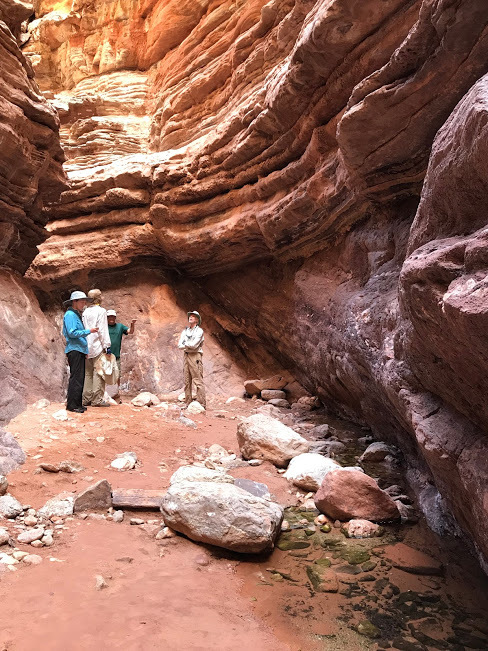 The Tapeats was deposited variously on top of late Proterozoic Super Group members where they occur, and on top of the early Proterozoic Vishnu complex where the Supergroup is absent in much of the canyon. We may also recall that the Vishnu complex includes both highly metamorphosed sedimentary rocks and magmatic plutons which injected and overprinted any age information in the sediments. Our best overall dates for last crystallization are 1.7 billion years ago. Where the Tapeats sits on the Vishnu, a little arithmetic reveals that the Great Unconformity spans 1.16 billion years. This is almost exactly 1/4 of the time since our planet is thought to have coalesced from stardust 4.6 billion years ago. Above is the unconformity in Blacktail Canyon. 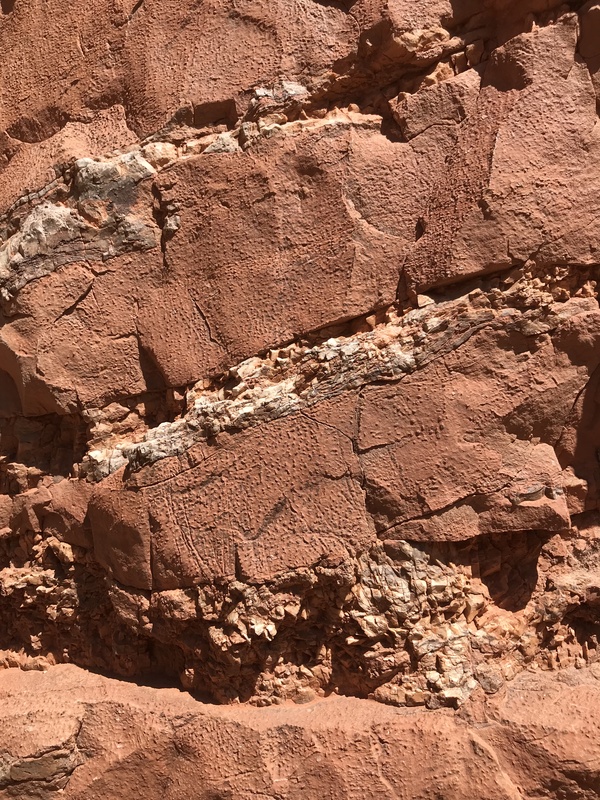 The bedding within the Tapeats above the unconformity is highlighted by the different lime content and erosion resistance. If you look carefully, you will see some very thin bedding just above the contact, that based on color, seems to be erosion from the Vishnu. These redder bands alternate with lighter material from a different source, possibly the same source as the lighter bedding seen generally in the Tapeats above. Really though, the Great Unconformity between the Tapeats and Vishnu overstates the case a bit. The Supergroup is absent here, but it exists elsewhere in the Grand Canyon. The Vishnu was folded nearly vertical at some point. 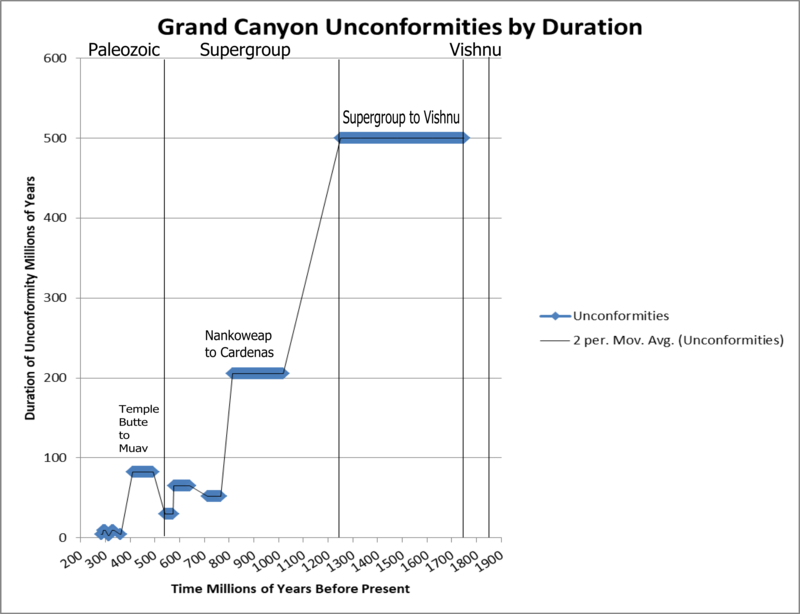 The Supergroup was tilted against the Vishnu at some point, and both were eroded to a nearly flat surface during the Great Unconformity. This flat surface eventually received the Tapeats, and the Tapeats therefore overlies the Vishnu and each of the tilted layers of the Supergroup in turn. Above we show a more fair representation of the Grand Canyon unconformities. These were assembled using date ranges for members from Wikipedia and Macrostrat. The two sources do not always agree, so a measure of our own judgement was required. This cannot be considered the last word, but the general trend for longer unconformities the further we go back in time is clear. It may be that as you go back in time, the probability of having had a long unconformity that erases a lot of little ones increases. Or it may be that the breathing of the great beast has sped up. Ludwig Boltzmann was the pioneer of statistical mechanics, a notion that although some important things are unknowable to us, like the position and velocity of every atom in a watermelon; we are not entirely powerless. He showed us that in situations where we can count the possible ways the atoms could be rearranged and still appear to be a watermelon, we can calculate the probability of a watermelon. Unfortunately, neither watermelons nor great breathing beasts are among these situations. Unconformities are the most fundamental and largest scale changes evident in the Grand Canyon, but they are by no means alone. Every layer shows some level of fluctuation between more marine, calcerous, well sorted periods; and more terrestrial, silicious, and poorly sorted periods. We saw the fluctuations in the Redwall above in the last post. Above is some detail of the Cambrian Muav from National Canyon. If you measure the average distance between the bands and factor the section thickness and duration of the Muav you can calculate the intervals. This is a crude exercise. It can tell you it is probably not 100,000 years, and probably not 10 years. Above is some context of the finely bedded Muav. If you measure the spacing of these fluctuations within the Muav, or the Redwall or any other large scale stratum, you discover that despite the appearance of regularity, the spacing is never exactly the same. One could take a section of aside creek like the one above that cuts through only the Muav, and imagine it as a miniature Grand Canyon. Sequences could be identified , grouped, and dated, and possibly unconformities could be found. This has been done for the more wildly varying members like the Supai. Ultimately our groupings, and how sharply we focus our scope becomes somewhat arbitrary. It is our nature to rationalize and categorize, but at some point we are always left like Ludwig Boltzmann; trying to count the possible ways this all could have happened to assign a probability, when all we can see is the apparent result a great breathing beast. This entry was posted in Geological Evolution of the Western United States, Paleogeography. Bookmark the permalink.